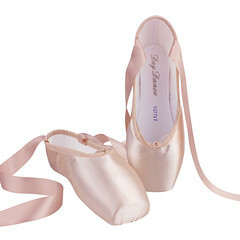 Whenever someone mentions the words “pointe shoe”, my mind instantly pictures something in a pale, pink satin. 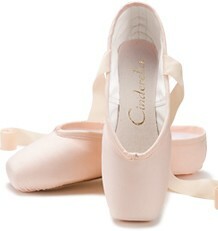 I don’t conjure up images of rough, sturdy material as a covering for something as feminine as the pointe shoe. I realize dancers have many different roles to dance and each role has its unique requirements in the footwear department. 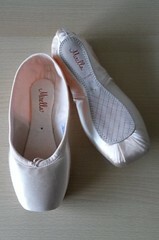 Like sushi, specialty pointe shoes are an acquired taste. 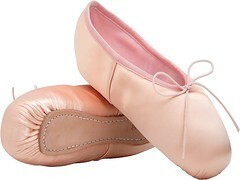 Capezio makes custom ordered leather pointe shoes for customers who don’t mind waiting 6-8 weeks. I am willing to wait much, much longer. Of course, I don’t mean to sound overly critical about this sturdy material; it’s just that I am partial to the sleek, smooth look of satin. I have a few questions about these shoes. 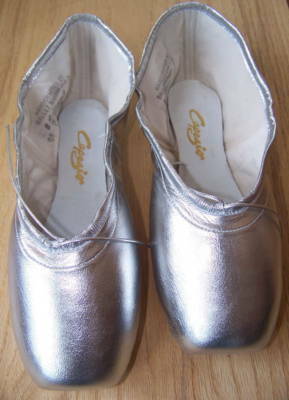 What type of performance would require a dancer to wear silver leather pointe shoes? Perhaps these would have been used for dancing the role of the Tin man in The Wizard Of Oz. Who knows? 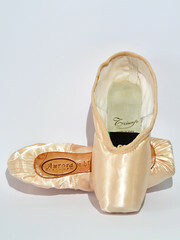 This entry was posted in Pointe Shoe Images and tagged Capezio Leather Pointe Shoes, Capezio pointe shoes, Pointe Shoe Brands, Pointe Shoe Images, Red leather pointe shoes, Silver leather pointe shoes. Bookmark the permalink. 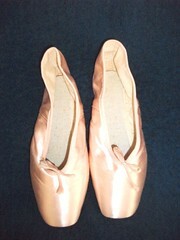 Capezio made leather pointe shoes as a standard product into the 1960’s. I have a pair from the 1940’s……. 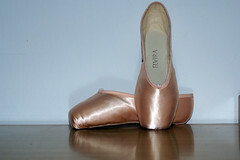 Bleyer made leather pointe shoes. They were used primarily by students– they didn’t wear out quickly. 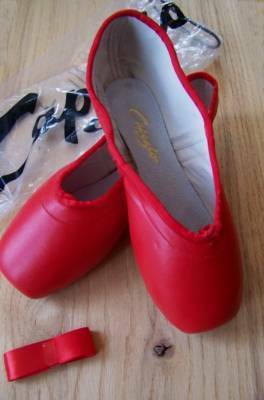 Later were replaced by the suede tip Duro-Toe Capezio and other brands—-I have modern Porselli pointe shoes with suede boxes.